This morning Marsh and his brothers and Posy went to see Sally, our vet, for confirmation of the eye condition. She was unable to give any definitive answer because he will change as he grows, but it seems like there are no eyeballs and even if they eyelids do part/open then he won’t have any sight. Sally suggested looking out to see who is the guide pig out of his brothers. Apparently dogs in the same position will form strong bonds with a sibling and they are then rehomed together. Sally would like me to ‘keep him back’ for a while so we can monitor him as he grows. 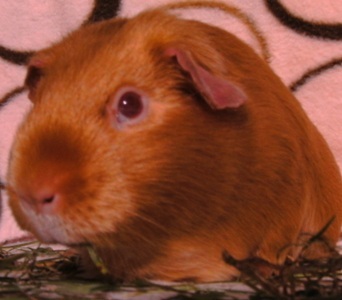 He will be rehomed eventually, and will go with his chosen one from here so will not be available as a single guinea for pairing with another. This way at least when he goes to his new home he’ll have someone familiar round him. 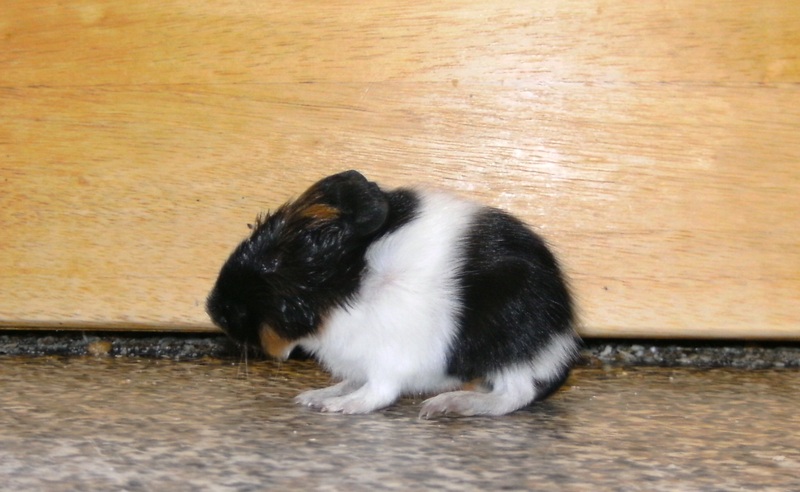 This is little Marsh who was born either with no eyes or they are stuck fast. I’ve tried bathing to open them (guineas do get sticky eye at birth sometimes) but it hasn’t helped. Probably a result of inbreeding. Today little Tree went to be a star on Planet Guinea, she’s the dark and light patched one that likes to shadow other stars. Tree was one of the heavier babies but that didn’t count for anything today. This morning she was out of sorts, still active but something wasn’t quite right. This afternoon I found her little body on its own, she had passed away some time ago. I must admit I was more disappointed than shocked, I was half expecting it. I just hope this is the last one to leave us, it’s not good for Mum (Posy) to keep losing them like this. They may only be animals but there is a sense of loss I’m sure. Despite the sense of loss a mother sow will let the babies have their own squabbles about who’s going to suckle, there’s no ‘he’s smaller than you etc etc’, and nature plays a big part. Yesterday the lovely Rosa went to be a star on Planet Guinea. She’s the very shiny one that moves with meaning and purpose. Even when at first she can’t be spotted it’s not long before she’s there in the ‘front row’. Rosa was given to another rescue because her Humans could no longer keep her. They had originally bought her from the stock for sale pens at a show- Rosa was a purebred Saffron Satin. The rescue quite rightly decided that they would inform any prospective owners of all the dangers of Osteodystrophy (a metabollic disease present in some Satins). Unfortunately the matt guineas sounded like a safer bet and Rosa was left on the shelf and the rescue decided to keep her. At that time I had room for someone to join us so Rosa arrived to see who she would fit in with. Unfortunately Rosa had a few issues with joining a group but took to the second group who ignored her completely while she ‘got over herself’. Rosa had this need to tell everyone she was boss despite the fact that no one was bothered- but told they were. Eventually Rosa settled down and even helped to integrate the humanised Genie into the group. The transition from insecurity to simple completeness was an honour to watch, and has been commented on by several people! Only a couple of weeks ago Rosa visited a school with Rainbow and her pigture is on the wall in the classroom and in many exercise books. She has also visited vet open days were she was the shining example of a ‘good satin’. But Rosa’s most important bit for Pigdom was to show that not all satins will suffer from Osteodystrophy. Though this is something she could’ve gone on to develop there were never any signs of it and she isn’t one of the ‘chunky’ pigs that are talked about as being ‘good stock’. Little Leaf, one of The Magnificent 7, has gone to be a star on Planet Guinea. He’s the tiny bright one that moves in fits and starts. All was well last night but this morning, despite still moving around normally and being generally ‘well’ things had started to change. I took Leaf out to feed him a little Critical Care (which he wasn’t interested in) and when I returned him to the cage he didn’t go find his siblings as per normal. I put him back with them and he settled in, nice and warm, but when they went exploring he made no effort to go with them, unlike yesterday when he’d kept with the group. I guess he knew what was coming. I found him away from the group and no one was taking any notice of him, they’d probably all acknowledged him and were just getting on with life. … made their way onto Planet Guinea this afternoon at around 3.30 and finished arriving at around 4.30. Not totally sure on times but it took about an hour for them all to arrive. The eighth, Wonder has already gone to be a Star on Planet Guinea. 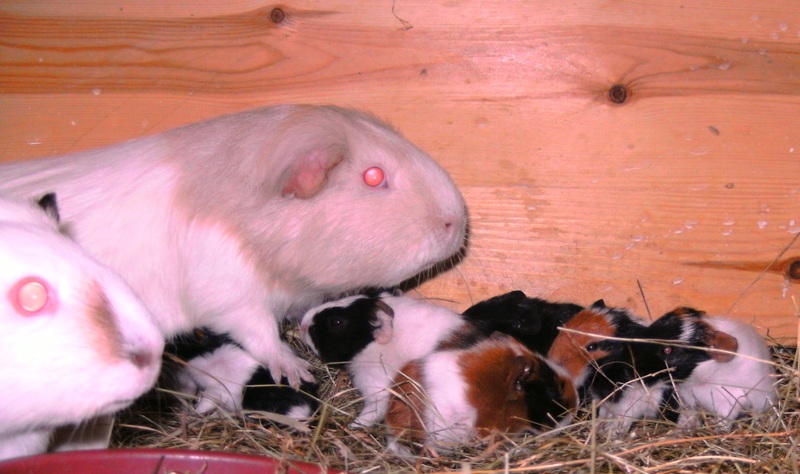 I found 4 little bodies all clean and correct linerd up nose to tail as per usual and quite fluffy, but was suprised to see Posy still had bright red blood on her nose, guineas are normally so quick at cleaning up inbetween and after birthing. Seconds after this thought I noticed a ‘lump’ under Posy and lo and behold there were 5, this was number 6 actually, number 5 was Wonder, now a star on Planet Guinea. Number 6 was cleaned up and ‘got moving’, then Posy went back to see Wonder and had another vigourous groom etc, it was not to be though. In quite a short time the last two were born and I moved Little Black round to Posy to clean up as she’d started eating and grooming herself. My guess is (though thats all it is and it could be quite different!) that Posy had 4 quite easily, then Wonder the little dead one. Because the first 4 were so dry and fluffy I tend to think that it took quite a time for Wonder to be born, at one stage they looked like 2 different litters but they’re all dry now and snuggled together.